Joining up with a travel group is a great way to see Idaho. 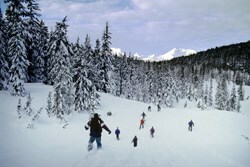 In the winter, there is plenty to do and numerous ways to enjoy the snow, including skiing. This is the perfect location to get some fresh air and enjoy the outdoors. And you'll find it a great deal cooler than South Africa right now. Singles come to Idaho to enjoy the company of new people and check out all that the state has to offer. Here in the United States, Idaho is one of the best places in the nation to enjoy a beautiful landscape and fresh air. There are national parks, reserves and monuments throughout the area and people come from around the world to check out the great expanses of land. One of the best ways to enjoy Idaho is to get out in the snow. Groups come out in droves to take to the white powder and head out to the slopes. Some plan to ski while others bring along snowboards. Whichever method a person selects, there is no doubt that it is quite an experience to head down the mountain. Resorts are spread out all over the state and when it comes to single holidays, it is not unusual for a group to stay at more than one place during the trip to Idaho. Many groups check out resorts in Bogus Basin, Brundage Mountain and Silver Mountain. Even with snow covering the ground, there are plenty of opportunities to visit some natural attractions. Yellowstone Park is probably one of the most common places that visitors seek out. Even in the winter, the geysers and hot springs are a real attraction. There are not a lot of places that individuals can enjoy a natural hot tub experience outside while snow covers the ground. There are some places that may be difficult to get to if there is heavy snow or rainfall. However, most groups tend to just find other activities to do during their visit. The backdrop of the cliffs, the water and the beautiful sky make this a great location for single holidays. When the temperatures drop, the water is still home to plenty of critters that plan to stick around. Some visitors enjoy white-water rafting during their stay, but for many, it is much too chilly to brave the waters in the middle of the winter. Instead, they head out on a boat and look for the different fish that are prevalent in Idaho this time of year. Trout often come up out of the water and it is possible to practice fly-fishing in any one of the 50 bodies of water in the backcountry of Idaho. Visiting Idaho is a great idea during any time of the year. However, those people that are interested in snow and chilly temperatures will find that Idaho has much to offer its winter visitors. Check out all of the different activities available during the season and make sure to get out and see as much of the landscape as possible. Dean McDermmot writes regularly on outdoor adventures for a wide range of travel websites and blogs. He has spent the majority of his career working with RBS 6 Nations and has traveled around the world with his team. He believes that every person should experience an adventure vacation and try something new at least once.